Every day the San Francisco Municipal Transportation Agency (SFMTA) receives approximately 40–50 reports of vehicles blocking or obstructing the public bike lanes on the streets of San Francisco. Some of these are ride share vehicles that have momentarily crossed over a painted white line while others are more aggressive offenders that have egregiously driven over or around a parking protected delineator designed to clearly protect cyclists from traffic. Whatever the scenario every time a vehicle crosses into a bike lane it forces cyclists to merge into busy city traffic where they are unprotected from fast moving cars and trucks that can crush them in an instant. 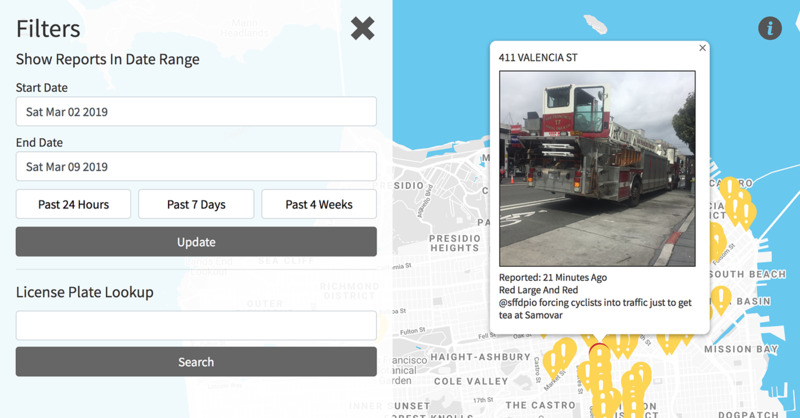 Safe Lanes fetches all blocked bike reports submitted to SF311, displays them on a map and analyzes the data to look for trends in how, when and where these reports are being generated. 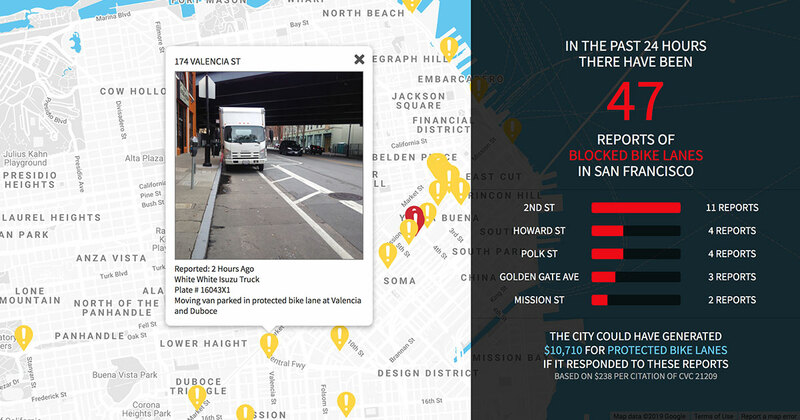 Help the public understand the scale of the problem of blocked bike lanes in San Francisco. Help the SFMTA strategically deploy parking control officers to protect our bike lanes along corridors and at times with a high volume of reports. Leverage the data from these reports to inform the design of future protected bike ways in San Francisco. This project launched in early April and is actively in development. If you are passionate about improving our protected bike lane network in San Francisco, are skilled at data analysis or just want to help expand the reach of this platform, please get in touch.